As pediatric speech language pathologists, the most common question we get asked is, “What can I do to help my child start talking?” There are many things that parents and caregivers can do to help encourage communication in young children. We recommend using the following speech and language stimulation techniques to instill in your child the need for speech. Children need to be shown that speech is important for controlling and interacting with the environment and for expressing ideas and feelings. 1) Read, Read, Read! The best thing you can do for a child is to read books with them. Choose colorful books with large, simple pictures. Talk about the pictures rather than just reading the text. Encourage interaction from your child by asking him/her questions. Point to what you are talking about. 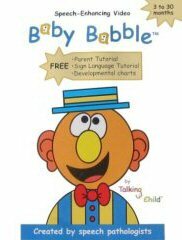 Click here for a list of books speech therapists recommend. 2) Encourage Communication. Once your child is old enough to communicate using sign language or words encourage communication. Wait for your child to ask, gesture, or sign for a toy on a shelf, rather than just getting it for him. Do not anticipate your child’s need or desires before he has a chance to make them known to you. If your child gets what he wants without communicating for it, he will not bother to point, gesture or ask. 3) Wait, wait, wait. Delay your responses to your child’s pointing, gestures or babbling when he wants things. Pretend you don’t understand what he wants to see if your child will try to verbally communicate. Pausing allows your child another chance to verbally express himself. 5) Self Talk. Talk out-loud about what you are seeing, hearing, doing and feeling when your child is in earshot. Your child does not need to be paying attention to you when you are talking out-loud to receive the benefits of speech. 6) Parallel Talk. Talk out-loud about what is happening to your child. Describe what he is doing, seeing, hearing and feeling when your child is in earshot. Again, your child does not need to be paying attention to you. 7) Praise your child! Respond to your child’s speech attempts with non-verbal and verbal praise. This will encourage him to try and communicate more and more. 10) Sing to Your Child. Song promotes vocal play, attention, listening, and speech. Sing simple songs your child can sing too. (Ex. The Itsy Bitsy Spider; The Little White Duck; Twinkle, Twinkle, Wheels on the Bus). Is my child speech delayed? Click here for to view our child development charts. What if my child is not talking? Click here. How can I play with my child to promote speech?